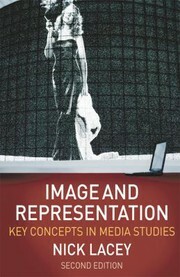 Image and Representation 2e is a clear and straight-talking introduction to two of the most important concepts in film and media studies. Exploring media language and representation throughout a variety of visual texts, the book offers a balanced, in-depth guide to the essential theories and key issues. The book begins by introducing the basic components of image analysis, including mise en scene, framing and anchorage. It then elaborates on these key ideas to provide the reader with a more advanced understanding of media language and representation. From the contribution of semiotics and debates around authorial intent, to ideas about hegemony and issues around propaganda, Nick Lacey offers approachable explanations of complex ideas and terms. The new edition is also now updated to reflect recent changes in the field, with particular attention paid to new media technologies. Each chapter is packed with memorable examples from a wider range of media and provides greater global perspective on today's media landscape. Gradually building up the reader's knowledge to encourage independent thinking, this is an essential resource for students taking courses in media, cultural, communication and film studies at school, college or university. 9780230203358 PDF is available as a free download.